The limestone landscape of the Yucatan Peninsula is famous for the hundreds, perhaps thousands, of sinkholes and natural pits that dot the region. 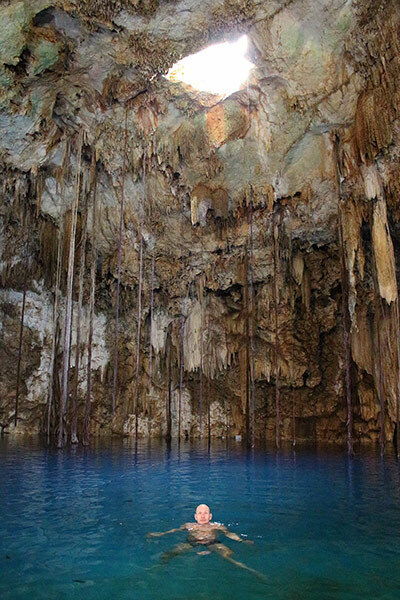 Known locally as “cenotes,” these formations pop up (or should I say down?) across the region. They are so common that they are deeply interwoven into Mayan ritual and legend. Some cenotes still contain ancient pottery, skeletons or other remnants of the past. Many cenotes interconnect to form large, very enticing underground cave systems. 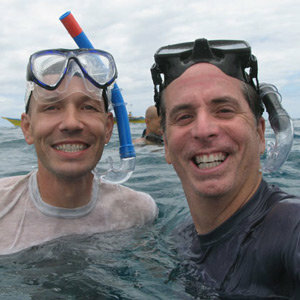 It’s the ultimate playground for those who like to crawl or swim their way into their own Jules Verne adventure. Our big goal for this Latin America trip is to slow it down just a notch. Rather than moving every couple of days, we decided to base ourselves in a nice location, do day trips out, and come back to a familiar place at night. 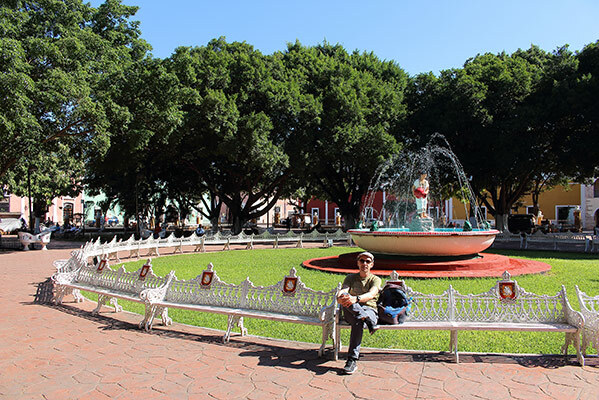 Here in the Maya heartland, we chose the charming colonial town of Valladolid as our hub. And I’m happy we did because Valladolid offers two of my favorite things: relaxation and food. After only a few days of honeymooning on Cancun’s beaches, it was time to return to normal life and explore some Mayan ruins. 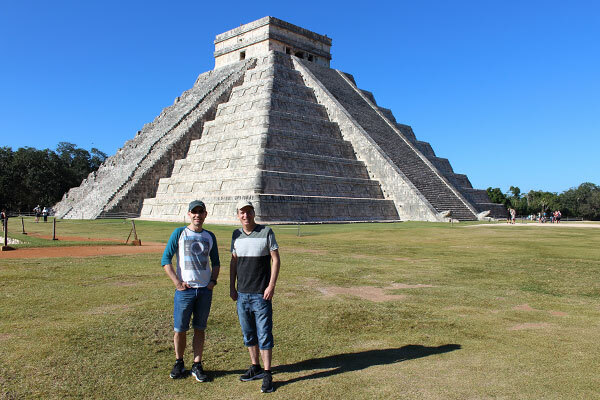 So we headed straight for Chichen Itza, the world-famous UNESCO World Heritage Site. In order to beat the afternoon sun and the hordes of visitors, we arrived early and even managed to snap a few pictures of the impressive El Castillo pyramid without anyone in it. Ducking in and out of trees and bushes, we continued exploring the rest of Chichen Itza’s attractions: the large ball court, the observatory and the Temple of Warriors to name just a few. Unfortunately, since a tourist fell off El Castillo in 2006, all the monuments have been cordoned off and closed to the public. This means no scampering up the pyramid, no climbing over rubble, or no seeking shade between pillars. What’s an Indiana-Jones-wannabe to do? I have to admit it definitely took some of the fun out of the experience. It also made it quite difficult to get a close-up look at all the great stone carvings which portray the Mayan history in all its graphic detail. Just look at the picture below of someone holding a human head. Yikes! 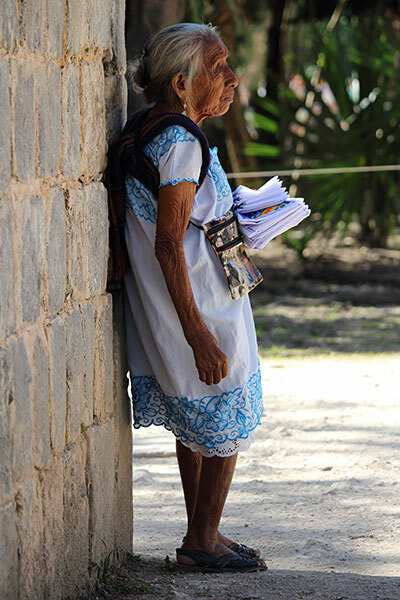 I stood watching this little old woman selling embroidered handkerchiefs near the Great Ball Court in Chichen Itza. The tiny Mayan woman, who could not have been more than four and a half feet tall, was hiding from the heat in a shadow waiting for tourists to wander by. Imagine standing in 90 degree heat all day long at her age to make a few dollars a day. It puts our splurge in Cancun into embarrassing perspective.